This venue no longer offers live jazz on a regular basis. 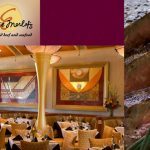 Eddie Merlot’s is a high end steak house restaurant chain with a location here in Columbus. Actually, the restaurant is located north of downtown Columbus about 20-25 minutes just off of the I-71 freeway near the Polaris shopping center. While food and wine is their specialty, the owners of the Columbus branch have actively engaged with the Columbus jazz community and offer live jazz at their place. Check our jazz calendar regularly for updated events there.